The lemon scented gum report. from Daniel Doody on Vimeo. Along Mt Alexander Road in Parkville, is a lemon scented gum tree that sits on an island median strip, that City Link want to remove to introduce two new lanes and create a smooth traffic flow… they have already cut down 4 trees, but VicRoads are still in discussion with the community on alternative arrangements to keep this one. UPDATE 2: Monday 25th July 2016: news is circulating that VicRoad may move on removing the Lemon-scented Gum in the next 24-48 hours, it’s imperative to show support & contact Guardians of the Flemington Road Gum if you can volunteer to guard the tree. UPDATE 1: VicRoads has reviewed Option 6 and provided a response. 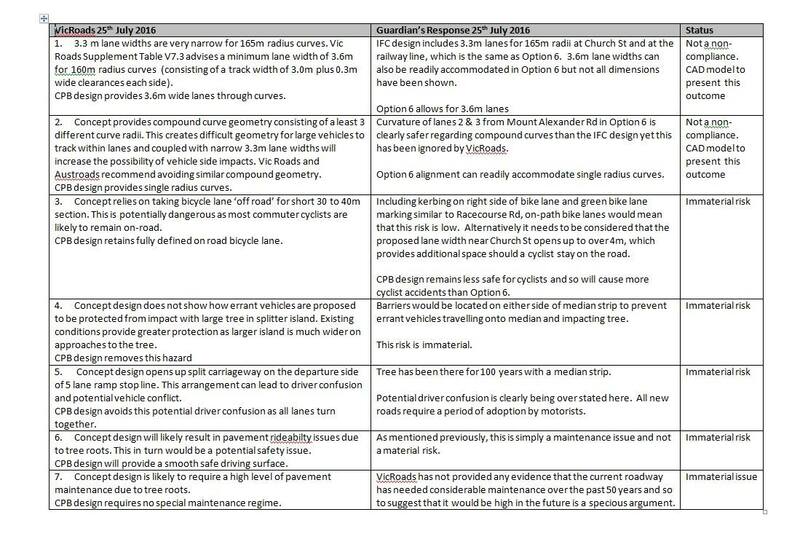 The attached table presents a guardian response to the VicRoads comments that were clearly aimed at discrediting the alternative design rather than moving closer to embracing a much safer alternative for motorists, pedestrians and cyclists. 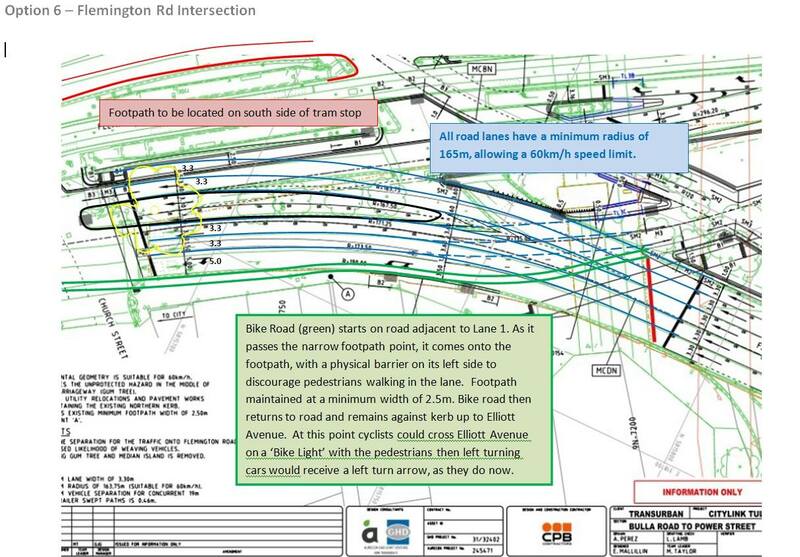 It is now up to Transurban to determine whether they will ignore the better design that has been developed. VicRoads’ failure to engage in community consultation over the redesign of the Tullamarine Freeway Flemington Road off ramp and intersection in Parkville that includes the removal of a stand of mature lemon-scented gums is costing Victorian taxpayers $40,000-$50,000 a day. Local residents have come together under the name Guardians of the Flemington Road Gum in an attempt to protect the remaining landmark tree classified as significant by the National Trust, potentially one of the first native Australian trees planted in a Melbourne roadway reserve. After being directed by the City of Melbourne to investigate alternative designs that retained the trees, VicRoads pushed ahead with their original intersection design and began removing the trees on 25 June this year. The Guardians managed to save the one large significant tree. Less than two weeks later, in a second aggressive move, locals were woken by chainsaws at 1am as the canopy of the significant tree was targeted in a surprise midnight raid. Quick-thinking residents were again able to save the tree by stepping in between its trunk and the work crew.